We've already talked about brushing tips for toddlers and being careful with sugar but if you're wondering about the importance of the fluoride in your toothpaste, here's a bit more information. Most patients I come across accept the role of fluoride as it's so widely used in toothpastes but there are those who avoid it and buy non-fluoride toothpastes. There's also the controversy around the addition of fluoride to drinking water which is only done in certain areas so I'll talk about the benefits as well as reasons to be cautious with fluoride but I wouldn't be afraid of it and recommend using fluoride toothpaste. 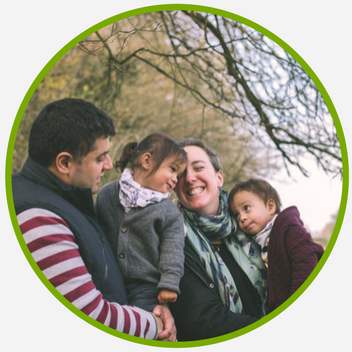 As always with my Toothy Tips series, this advice is based on my knowledge as a practising dentist in the UK and what I tell my patients, written from a personal point of view sharing what we do as a family when it comes to dental care. Always consult your own dentist with any dental or oral issues. So, fluoride - why is it so important? I'll explain a little about how it works so you understand the reasons for the advice below. Tooth enamel is made up of a crystalline structure called hydroxyapatite which is a mix of various ions. I don't want to get too technical but the ions which make up enamel are constantly "on the move" in your saliva, they basically swim around that top layer, de-mineralising and re-mineralising all the time. It's a constant balance and it's when that balance shifts that decay can happen. 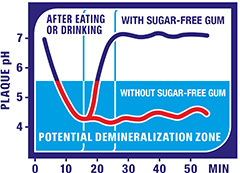 When enamel is under attack (from the acids made by plaque bacteria when they consume sugar), the top layer loses even more mineral and when the pH gets too low due to that bacteria-produced acid, the teeth don't have a chance to re-mineralise back to their normal state and you start to get damage. Remember those Extra chewing gum ads with the pH graph? It's true, if the pH dips below 5.5 for too long, you're more likely to get tooth decay. Early lesions appear as white spots initially and over time these can either stay as they are, progress to become yellow or brown or develop into cavities or be reversed (although will stay white or discoloured, sometimes going black which is what we call arrested caries). Once it's a cavity it needs to be cleaned out and filled, especially once it's through the enamel into the dentine layer which is much softer and more vulnerable meaning the cavity can get bigger more quickly. 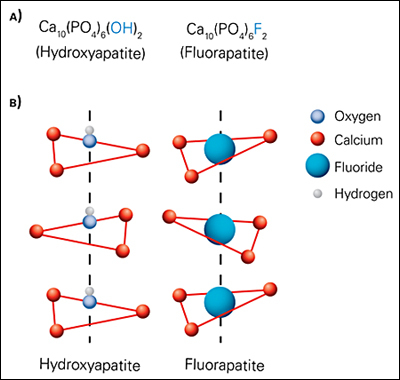 Where fluoride plays its part is in the re-mineralisation. If there's fluoride hanging around (either from your toothpaste or from fluoride you've ingested), the fluoride ions incorporate into the enamel crystals making fluorapatite. The fluoride ions take the place of the hydroxide ions which forms a much stronger structure which is more resistant to acid attacks. This means it takes longer for decay to develop and it could even be reversed in some cases of early lesions before cavitation. It also means you're less likely to develop any new lesions. There have been many many studies done showing how effective fluoride is in reducing decay. It also affects all surfaces of the teeth so if you've forgotten to floss and remove the plaque from between your teeth but you have fluoride hanging around in your saliva then you at least have that extra protection from cavities forming between your teeth. Although I'd still recommend flossing, it can only do so much and if you don't remove plaque regularly and take care over the sugar in your diet then fluoride won't prevent problems from developing entirely! So you see, it's pretty magic stuff really! It basically makes your tooth enamel super strong and can even reverse early damage to keep your teeth safe from needing the dreaded fillings! There are different ways of getting fluoride where it needs to be - placing it on the surfaces of teeth, or ingesting it. The main topical method being toothpaste. Scrubbing it around your mouth twice daily will give you plenty of protection as long as your toothpaste has at least 1000ppm of fluoride. (Most adult ones have around 1450ppm but some kids ones only have 500ppm which is not enough to be effective.) If you're deemed as being particularly high risk, like my patient in Glasgow who consumed excessive amounts of Irn Bru (we managed to wean him down to 8 cans per day) and needed new fillings every time I saw him, you can be prescribed a high fluoride toothpaste which has up to 5000ppm. so we managed to get different pink ones to avoid mixing them up. 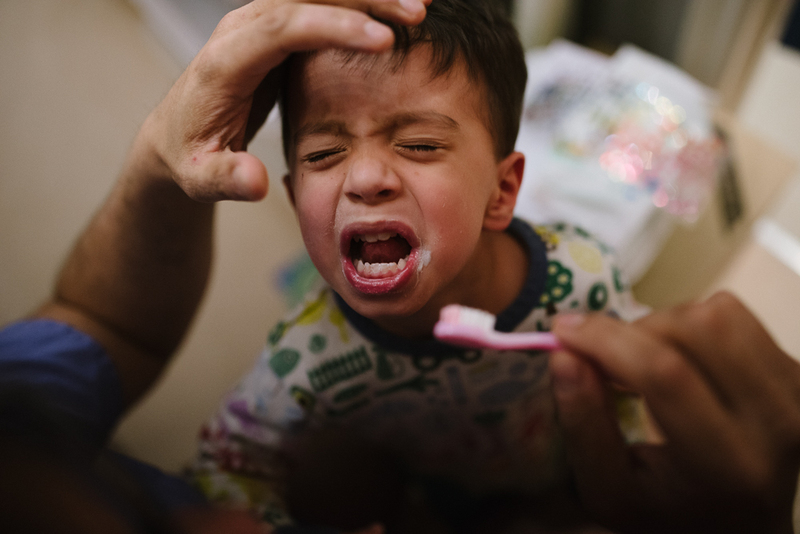 Dentists can apply a topical fluoride varnish to any areas of suspected early decay and nowadays it's recommended to be applied to all children aged over 2, every 6 months. It's now a routine part of my child check-ups unless the parent declines the treatment which has happened on occasion due to propaganda and scare stories. I always try to explain the methodology, safety and benefits and warn of the risks of not using fluoride as these people are also usually avoiding fluoride toothpastes as well but ultimately it's their choice, I just need to make sure they understand what they're choosing if they're coming to me for dental care. If you live somewhere without fluoride in the water and are high risk for decay, you can take fluoride systemically via supplements but I think this is less common nowadays. Although the benefits of fluoride are clear, there can be some downsides. 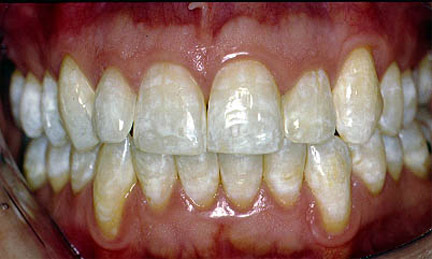 Fluorosis is caused by excessive intake of fluoride during tooth development. While you're young, your adult teeth are forming in your jaws, if you ingest too much fluoride during enamel production, these teeth can appear mottled or discoloured. They'll be super strong but will have white mottling and possibly yellowish or brown discolouration. Although this sounds like the same as early lesions above, they're distinctly different in appearance and where they are on the tooth surface. I myself suffered from fluorosis and actually got bullied at school for having "dirty teeth". Mine was quite bad with dark yellowing of the bottom halves of my two front teeth especially (I must contact my old dental school where my teeth were photographed before and after they were "fixed" during my work experience week from school). Because the mottling tends to be in the top layers of enamel, Fluorosis can be treated by removing that thin layer by applying acid and pumice to scrub it away. It made a huge difference to me when I was 14 and although my teeth aren't white, they're not too bad and I can live with them. Oh and I've never had a filling! The best way to avoid fluorosis is by ensuring kids don't swallow toothpaste and avoiding extra supplements if they're not needed, especially if you live in an area with water fluoridation like I did until I was 5. I was given fluoride drops and I remember always swallowing the toothpaste rather than spitting it out when I was a child. 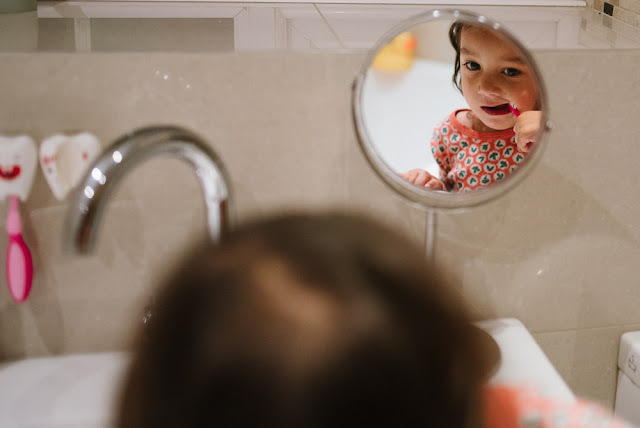 Very young children won't spit it out so it's recommended to only use a very thin smear for babies with teeth and a small pea-sized amount for children to ensure they won't ingest too much if they do swallow it. The reason for some people being against the use of fluoride is that it's toxic. It's true that in large concentrations fluoride is poisonous but so is paracetamol if you overdose. Even water is toxic if you have way too much. The key is not to overdose on fluoride. It can indeed be very dangerous if taken in large concentrated quantities like a child drinking a whole bottle of fluoride drops and if that were to ever happen, immediately give them milk which binds with the fluoride to stop it being absorbed into the body. The amount of fluoride necessary to cause death for a human adult has been estimated to be 5-10 grams of sodium fluoride, ingested at one time. It's impossible to get that much via fluoridated water as the amounts are so low. 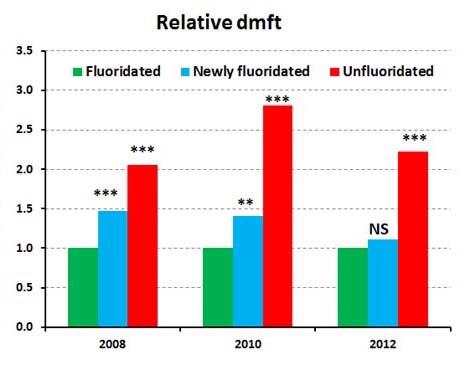 In summary: Don't be scared of fluoride. 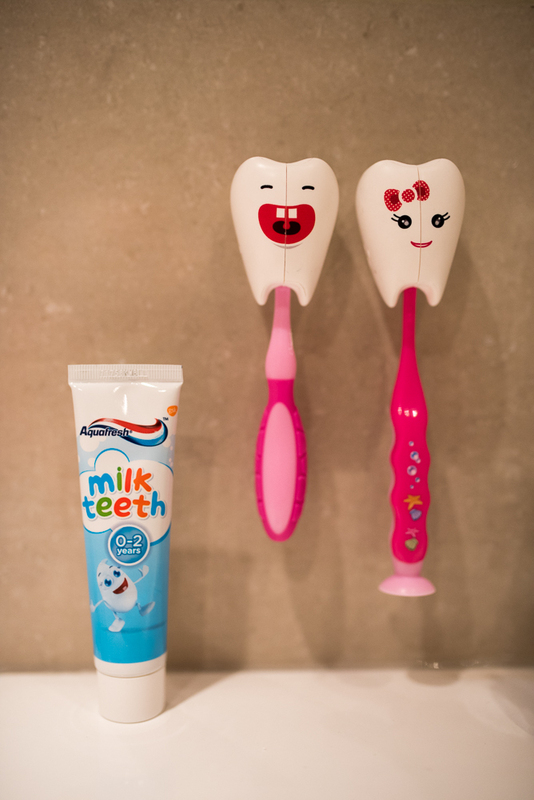 Best practice is to brush your teeth twice a day, ideally in the morning and before bed, with a pea-sized amount of toothpaste for children. This ensures children do not ingest too much fluoride should they swallow it rather than spitting out. We recommend supervising (including going over their attempt) until the age of seven. If any acidic drinks are consumed (e.g. fruit juice with breakfast), it's best to brush beforehand or wait at least 1 hour so as not to remove micro layers of enamel which may have been excessively softened by the fruit acids. The toothpaste should have at least 1000ppm of Fluoride. There are different types of Fluoride but the ingredients on the toothpaste will state a "ppm" number, parts per million. 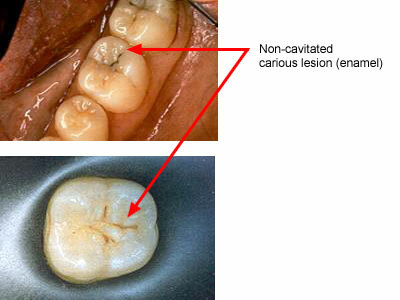 Anything less than this is not effective enough in reducing the risk of decay. When you've brushed your teeth, spit out any toothpaste but DO NOT rinse your mouth out. This leaves any remaining toothpaste coating your teeth and allows more of the Fluoride to "soak in" to your teeth. If you wish to use a mouthwash, use it at a separate time to brushing. Perhaps after a meal to freshen up or between meals during the day. You can also buy fluoride mouth rinse. Use the Modified BASS technique when brushing, this is demonstrated in this video and ensures that you are cleaning effectively around the gum levels where plaque starts to gather. Think of it as massaging your gums with the toothbrush and if there's any bleeding, this means you have gum disease and need to be cleaning the area more, not avoiding it, but it shouldn't be painful. Brush for a minimum of 2 minutes to ensure you're reaching all areas effectively. If your dentist offers to place fluoride varnish or prescribe fluoride toothpaste or mouthwash - let them and use it. Not always! But it still gets done. Megan loves getting her teeth brushed. 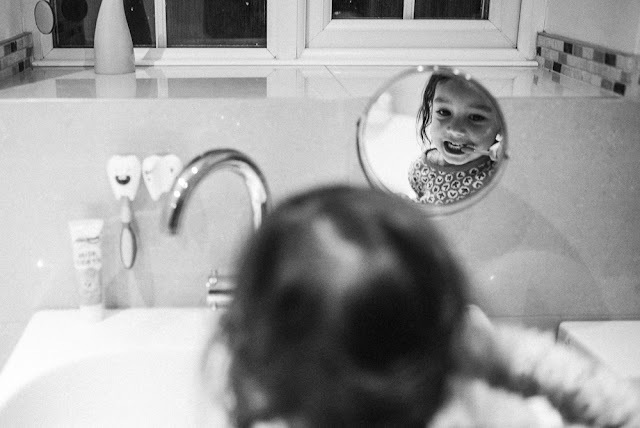 She is usually a fairly happy child but 2 things cause mini tantrums, wanting food (especially if she spies a 'nana') and wanting to get her toothbrush and alas she knows if we put no toothpaste on. Too clever. I guess it is better than her hating having her teeth brushed? 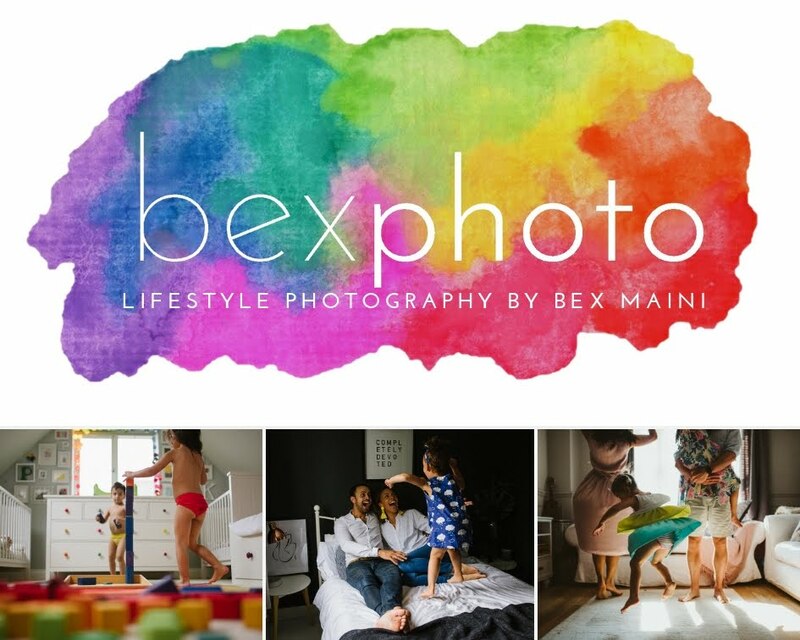 I've just read the whole of this series, really, really useful. I don't have great teeth - I had most of my baby teeth taken out in p1, ribena in a baby cup wasn't a good idea apparently and then due to my Mums phobia we had a few years where we didn't go to a dentist at all. I've attended regularly since I was 14 though and interestingly my 2 yrs living out in China were best for my teeth health. Pregnancy wasn't so kind though. Anyway I really want Megan to have good teeth. I do need to find some alternative snacks as too often raisins or a banana are my go to. When did you start giving cashew nuts to your two? No risk of allergy, she's had plenty of nut containing things just no actual nuts yet. James (8) has fluorosis. I really don't know how! The dentist said that she had seen a lot of children lately with it. How old should he be before we get it treated as it really does effect the appearance of his teeth which were always so beautiful when he was younger. It really upsets me that his teeth are discoloured as I didn't realise it was treatable. great tips, thanks for doing this for us. I have my 6 and 4-year-old use alcohol-free mouthwash after they r done brushing, you know just to take care of that hidden germ. So sorry for the late replies guys! Priya was poorly then I got really ill for a whole week! Still recovering but back at work now and had 5 mins at lunch to check in! Marjory: That's fab that she likes to have her teeth brushed! I think they were maybe 18 months or perhaps 2, just when we weren't worried about them choking on them. I know about the raisin thing, those little boxes are SO useful and we do use them as emergency snacks when out and about at those times you just need to guarantee a tantrum free time. They have their place and there are worse things but just be aware of the issues and keep it minimal ;) If you're worried about actual nuts, mine also love nut butter on a rice cake - they call it chocolate!? Nicola: Mine were treated at 14 but I'm not sure he needs to wait that long, the only risk I am aware of is taking too much enamel away - mine was done be a specialist in the dental hospital I was doing work experience in! Nash: Glad you found it useful! If you want to use a mouthwash, I'd recommend it at a different time to brushing but there's really no need if you're doing thorough brushing at that age.